Roofs, Bricks and More Bricks! 1) On the Amstel Garden House, they used some shingles that are wider than 9.5". 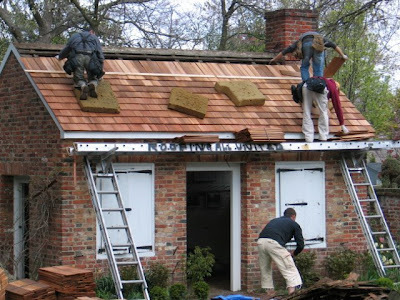 We are concerned that they may split as the shingle expands and contracts. If a split occurs below the joint in a course above or below it, it's possible that it may leak. 2) On the same building, they allowed joints between shingles to repeat after just two courses instead of three - which is preferred for wood roofs. 3) On the Dutch House garden house, which has a hip roof, they did not match the overlap detail at the ridges on the hips. the shingles should overlap in an alternating pattern. Instead they mitered them and butted them against each other allowing two joints directly above each other - another possibility for leaking. 4) The shingles are uneven where they meet at the northwest ridge. 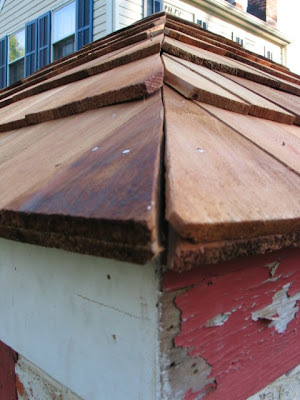 5) A few shingles split or were not wide enough to complete the miter joint at the ridges. On Friday we met with our mason, architect and general contractor to discuss how to proceed with the fireplace and chimney restoration. We discussed plans to keep the fireplace in its original configuration with as little restoration as possible. I think we'll be keeping the original plaster in place and will not use new plaster to fill in areas of missing plaster. We'll also rebuild the chimney as it was originally - voids and all. Finally, we will rebuild the squirrel-tail bake oven some time in the future - under a different project (time to write some grant apps!). We also talked about ways to make bricks for the hearth ourselves. We'll be digging a big hole in the Amstel House yard about mid-June for a dry-well. We're keeping our fingers crossed that the hole will yield some good clay that can be used to make bricks. Our mason suggested getting our members and the public involved in a brick-making workshop. 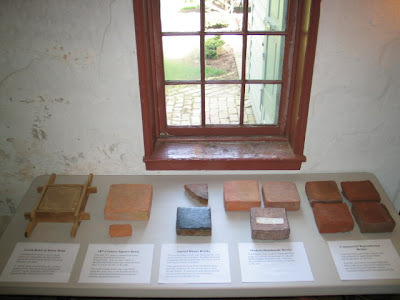 Then we may explore having our handmade bricks fired at Colonial Williamsburg or - in the ultimate historic brick-making fantasy - build our own kiln here in town and do them ourselves in an authentic 18th century manner. Since the brick-making process will take some time, we'll keep the existing hearth as is and fill in around it with additional bricks temporarily. Sounds like a cool project in whatever guise it eventually takes! Today, I went brick-picking and brought back 89 more historic bricks - that brings our salvaged total to 389! 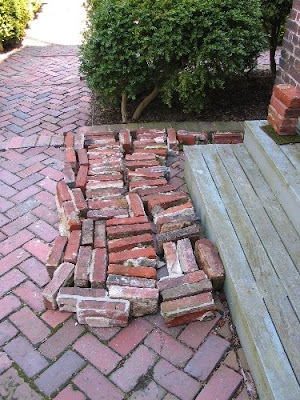 Unfortunately, my brick picking skills leave a little to be desired so the masons may reject alot of what I've recovered so far (I'm hoping for only a 30% reject rate - we'll see!). I think that's about it for today. I let you know how the roof goes tomorrow (hopefully it won't rain). The roofers spent pretty much the whole day on the garden house. The rear roof was already removed, and they made short work of removing the front roof. All the shingle lath was left in place. The roofing crew is just finishing up for the day as I write this. They need to do a bit or work around the chimney in the morning then they will move on to the Dutch House. The dumpster did not arrive today so the old roofing debris will remain on site overnight so we'll be closing the garden to visitors this evening. On a related note...one of our guides, Martha, told me a great story today that she heard from a descendant of Mrs. T. Coleman du Pont. Mrs. du Pont was instrumental in building the Amstel garden house back in the 1930s. It was made out of salvaged materials - bricks from an old house on the Atlas Powder Company property and timbers from the Pocopson Bridge (in PA I think)- to make it look old. 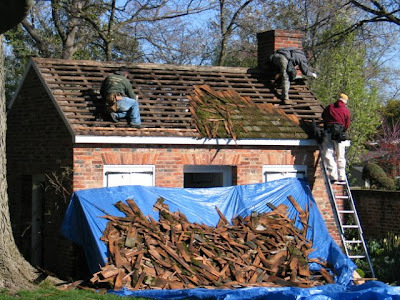 So when a new wood roof was installed, the nice new shingles just didn't fit with the look Mrs. du Pont was after. Someone apparently advised her that if she poured beer all over the shingles it would artificially age them. So she and her son came to the Amstel House one morning and proceeded to pour beer all over the roof. In the process, Mrs. du Pont got pretty well drenched by the brew. She arrived home around noon - probably smelling like a brewery - to find a group of guests waiting for her that she had forgotten that she invited to lunch. Imagine their surprise! So...While I don't intend to pour beer all over the new roof - since tomorrow is Friday - I think I may just have to crack a cold one and raise a toast to Mrs. du Pont and her dedication to getting everything just right! In a 1938 address to the Garden Club of Wilmington, Mrs. Caleb Layton describes the reconstruction of the bake oven at the Amstel House (below). Based on her chronology leading up to the following excerpt, it sound like the bake oven was reconstructed just prior to May 1938. "Originally Amstel House had a Dutch oven which extended from the kitchen wall into a space paved with cobbles. 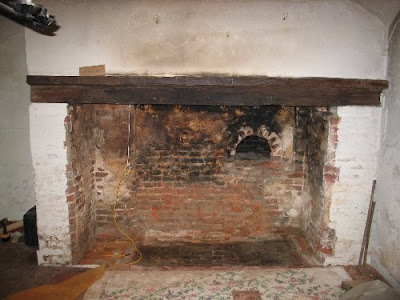 We decided to attempt to reconstruct the oven while the expert bricklayer was at hand sent by Mr. [Charles] Gillette from Williamsburg. The oven is not very large, but it has one feature that is not often found. Instead of an iron dorr [sic], it has a small brick shelf upon which a heavy oak cover is supported. The opening is not into the room, but over the hearth, inside the chimney breast itself, the space for the fire being slightly to the left. There is no connection between the oven and the chimney, and no chute for ashes. Apparently embers were taken from the fire and banked in the oven. Later when the oven was hot, they were raked back, and the heat was kept in by the thickness of the plank cover. Since Mr. Gillette was not accustomed to ovens [Gillette was a landscape architect from Richmond, VA.], we took the findings to Mr. [Erling] Pederson, who is the expert in charge of restoration for the Pennsylvania Museum [Philadelphia Museum of Art]. He made a sketch with proper dimensions for oven and dome, and thus the oven was restored." Bake oven just after reconstruction, c. 1938: This above passage confirmed for us the date of the reconstructed bake oven - about 1938. From Mrs. Layton's description it sounds as if the reconstruction was a relatively unplanned decision, but in fact Gillette's landscape plans from 1932, 6 years earlier, show the bake oven in its current location. Another thing Mr. Layton's decription tells us is that the 1930s restorers did not know that the squirrel tail flue existed ("There is no connection between the oven and the chimney..."). This is confirmed in the reminiscences of Bruce Gordon, a local contractor that worked on the Amstel House frequently between 1932 and 1968. Gordon remembers that he "opened the fireplace also. Fireplace appeared sound but wasn't opened all the was because of possible draft. Found beehive oven but did not work on it." 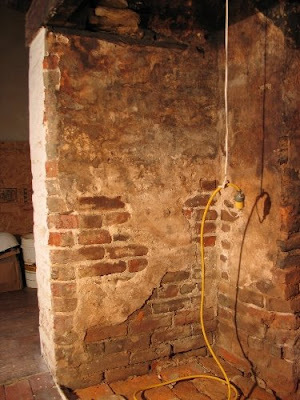 So Gordon states that the earlier restorers did not go as far as we have by removing masonry added after the fireplace's original contruction date. They left the squirrel tail flue covered by masonry added at some earlier time. Gordon also mentions that a "timber was taken from barn at 6th and New Castle [does he mean Delaware St?] for mantel (1930)." This confirms for us that the roughly hewn timber that was spiked to the lintel was definitely added during the 1930s restoration process. It reflects the colonial revival ideal of what a colonial kitchen fireplace should look like, i.e. pewter plates on the mantel and musket on the wall above. Gordon's memories of working on the house also tell us that the fireplace was closed in prior to the 1930s and that the opening was narrowed at some earlier date. It also indicates that they were aware that enlarging the opening might throw off the ratio between flue size and opening size and result in problems with the fireplace drafting correctly. My guess is that the chimney had already been reconstructed from the roof up. The reconstructed chimney, as noted in an earlier post, included a kitchen flue that was reduced from its 18th century size. As I'm writing this I realize that another thing that we discovered when we opened the attic is that the roof rafters are sawn timbers rather than hewn timbers. 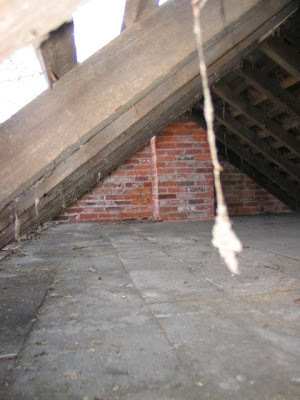 The beams in the attic floor, however are all hewn as expected. Was the roof rebuilt in 1905? Or sometime earlier? I'm supposed to be finding answers not developing more questions! More on what kind of information the archives are producing tomorrow. The last two days of the week, the masons spent their time dismantling the chimney to below roof level. They discovered that the interior of the chimney (the flue) was lined with clinker bricks. Clinker bricks are bricks that did not fire correctly in the kiln. They are often harder than normal bricks and often distorted in shape. Hence, their use inside the chimney where they would never be seen. Interestingly, clinkers became popular around the beginning of the 20th century when the Arts & Crafts movement was popular (Click here for an article on clinkers). They also noted that the mortar used between these bricks seems to be clay and sand. There doesn't appear to be any pieces of lime in the mortar. Needless to say, it's turning to dust. Another discovery was the that the chimney contains a void between the kitchen flue and the flue for the corner fireplace on the second floor. This took our masons by surprise since most chimneys are solid throughout except where the flues are. Why did the original builders leave the chimneys essentially hollow inside? Was it to save material and labor costs? Or could it be a regional method of construction? I'm not sure. When taken in conjunction with the random masonry pattern (half bricks, header courses on top of header courses) used on the walls of the kitchen wing itself - which defies categorization into any of the well-known brick bond patterns - I'm beginning to think that the builder was pinching pennies (not a fact, just a theory). Finally, they examined the 2nd floor fireplace and its construction is essentially the same (in smaller scale) as the kitchen fireplace below it. It was also plastered and the plaster is intact. A new firebox with firebrick was built in front of the original firebox when a damper was added, sometime in the 20th century perhaps. 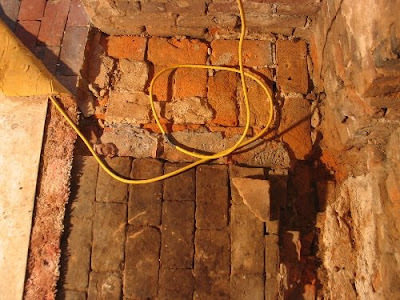 The masons asked about removing the modern firebrick to expose the original firebox. Since this bedchamber is not interpreted to the public (it's actually used for our office), I doubt that we will remove the firebrick at this time. We'll probably save that for a future project. The masons probably won't be back until Friday to give us some time to try to answer some questions and decide how to proceed with the restoration. I'm hoping this week we can open the house in the evening to invite New Castle Historical Society members in to view the hearth in its raw, un-restored state. More on that later this week. There's Nothing Like The Sound Of Jackhammers In The Morning! It rained yesterday in New Castle so the masons moved inside to work on the kitchen fireplace. The plan was to remove the "new" masonry to get back to the fireplace's original size and configuration. They warned me it might get noisy since they would be using a small jackhammer (my office is directly above the kitchen fireplace!) I closed the door and, being Irish, cranked up Radiocelt. At some point in the fireplace's history the opening of the fireplace was reduced in size. About 1.5 feet of masonry was added to the inside of the left leg and about 6 inches to the right. Additional masonry was added to the back wall of the fireplace, and more masonry was added behind and above the lintel. Our primary question about this added masonry was why was it added? Was it a structural issue? Did the fireplace smoke too much? Another question - what kind of condition was the lintel in? Is the crane original to the fireplace? We believe it was placed in its current location in the early 20th century because it impractically swings in front of the bake oven opening. We hoped to find original pintles in place that would match our existing crane, and confirm or deny its originality to the house. Is the bake oven original? We believed that the opening was indeed original though the oven outside appeared to be a 20th century reconstruction - it is severely undersized. I resisted going downstairs until lunch and the masons informed me that the original masonry looked remarkably well-preserved. I was expecting our architect and lead mason to arrive around 1 pm so I continued to exercise restraint and didn't look under the plastic yet. I wanted to wait for the great unveiling later! 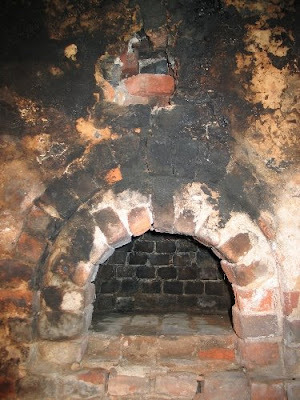 A flue opening directly above the bake oven opening revealed that the original bake oven was a "squirrel tail" design. In this design smoke from inside the oven exited through an opening at the rear of the dome, traveled through a flue that ran along the exterior (top) of the dome (like a squirrel with its tail pulled up over its back) and re-entered the fireplace smoke chamber above the oven door to vent into the smoke chamber then up the chimney (below). The inside corners on each leg of the fireplace were rounded and the interior of the fireplace was plastered. A large portion of the original plaster remains solidly in place (below). No pintles were discovered in the original masonry. There are no other indications of a wall-mounted crane ever being used in the original configuration. There are two iron rods running front to back inside the smoke chamber (below). Did these suspend a lug pole (an iron rod or timber that ran parallel to the lintel, spanning the cooking space below)? Pots could be suspended on trammels hung from this lug pole during cooking. Or was a floor standing crane used and these iron rods are actually tie rods to stabilize the chimney? 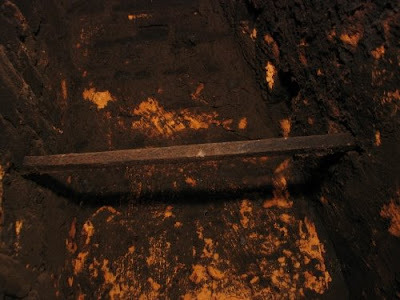 A fragment of a hearth paver that appears to be square and thinner than the brick pavers that were put in place when the fireplace was narrowed (The triangular fragment is just below the yellow cord in the photo below). Other fireplaces in the house use 6" by 6" pavers for the hearth. The lower section of the rear wall in the firebox shows no sign of soot. All of this poses more questions for us to consider: Should we rebuild the exterior portion of the bake oven to its original squirrel tail configuration? Can we find the oven's foundation through archaeological investigation? Should we lay the restored hearth with 6" by 6" pavers based on the fragment we found and the other fireplaces in the house? Where will we get them - can we have them made using local clay? Where was the clay dug in the 18th century? Is the flue correctly sized for the fireplace opening? If the fireplace was reduced in size to solve a smoking problem are we going to have a smoking problem if the fireplace is ever used in the future? How do we solve that? If we enlarge the flue then the chimney's exterior appearance will be too big. Is there a way to improve the draft using a fan at the top of the chimney? How well does that work - it is visible from outside or audible inside? Of course, as we are proceeding we are removing the work of previous owners and restorers of the building which reflect the building's history and evolution. We already came to the philosophical conclusion to restore the fireplace to its original appearance. How far does that philosophy carry into the rest of the room? Or the rest of the house? And the questions go on and on. Some of these questions will be resolved in the short term by our project budget, but many have far reaching implications for the interpretation of the house as a museum. As we wrestle with these and other questions, I'll keep you posted on what we decide to do and why. I've always said that every day is an adventure when you work at a historic site and today's adventure did not disappoint! 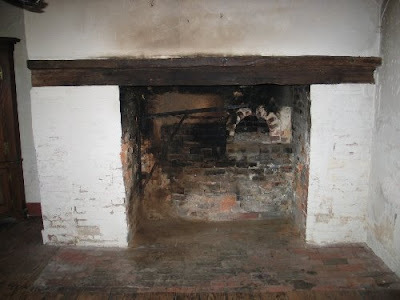 Our first major project at the Amstel House is the restoration of the kitchen fireplace, hearth, and chimney. We are restoring the fireplace to its original size and configuration, c. 1738. The project is expected to take about 5 weeks to complete. ...and found no framing - darn! It was apparent that someone had previously cut through the ceiling in that area since the original lath was cut back below a large timber, and the lath used in the patch was sawn rather than hand-split. 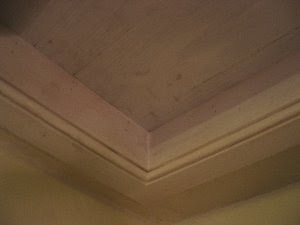 After consulting with our architect we decided to move ahead with our original plans to finish the opening permanently with a jamb, trim and panel so we will always have easy access into the attic for storage, maintenance and to trap the occasional squirrel or raccoon (if you live in New Castle you understand this!). We'll finish the plaster around it and paint it after the chimney is finished. Here a detail shot of the trim and door: On Monday the masons arrived for their first full day on work. Scaffolding was set up at the rear of the kitchen wing, taking a good portion of the day. The investigated the chimney as well as the condition of the other two chimneys and took some very valuable photos of the other chimney, flues, and roofs. As you might guess the photos reveal that additional work is needed (ugh!). But more on that later...Toward the end of the day the began deconstruction of the kitchen chimney. Meanwhile, I spent about two hours trying to pick appropriate bricks out of a huge pile of (mostly) 18th century bricks from a nearby house that was torn down (the owner was gracious enough to donate bricks for our project). For a novice like me, picking appropriate bricks is tougher that I thought. When I brought my first cache of bricks back to our site, the masons reviewed them and gave me some additional insight into picking good bricks. So when the weather clears up I'll go back to try again. That pretty much wraps up the first couple of days from my perspective! Welcome to Preserving New Castle's Heritage! Welcome to the New Castle Historical Society's new historic preservation blog! 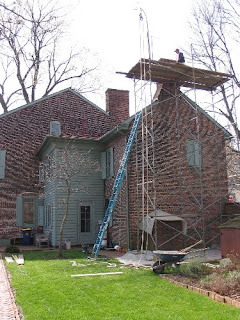 I'll be using this blog to keep you up-to-date with preservation activities, issues, and projects happening in and around Historic New Castle, Delaware. The idea for a blog developed last year as the New Castle Historical Society (NCHS) planned some major preservation projects on our historic properties - the Amstel House & the Dutch House. The posts on our original blog (on www.newcastlehistory.org) slowed down due to some delays in getting our projects started. Now that we are underway, I will use this blog to keep you informed about progress on our projects, our decision making process, treatment options and choices that we make. I hope you will find information that is useful in your own preservation projects.